There's no such thing as too much play when it comes to Stuffed River Otter 18 Inch Plush Animal by Fiesta. Needles to say, it's otter-ly amazing! Measuring at a convenient eighteen inches, this river otter stuffed animal is big enough to show off, but small enough to tote around and take with you wherever you go. Work, school, the park, the beach, you name it! This river otter plush toy will be your happy companion every step of the way. Featuring soft, durable plush, and stuffed to the maximum for optimum cuddles, this river otter stuffed animal makes for the perfect plush companion for any occasion. With such cute features, you can rest assured that the Stuffed River Otter 18 Inch Plush Animal by Fiesta is going to be pleasing to the eye and the touch. Whether you're adding it to your collection, or look for a lone critter to keep you company, this river otter plush toy is one you can't go wrong with. So what are you waiting for? Order yours today! For over 40 years, Fiesta Toy has been one of the world leaders and innovators in stuffed animals and plush toys. Their wide assortment of traditional and unique stuffed animals inspires creativity and encourages imaginative play. 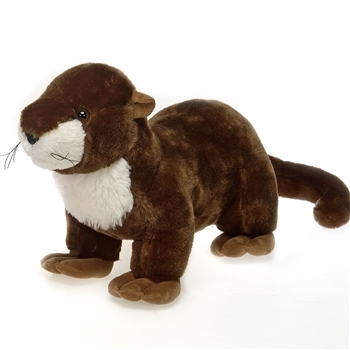 Fantastic products like this river otter stuffed animal allow children to share in the magic of the animal kingdom and learn more about the fascinating creatures that inhabit and share our planet. The Stuffed River Otter 18 Inch Plush Animal by Fiesta is made with all new, child safe materials and meets or exceeds all U.S. safety standards. Recommended for ages three and up, we suggest surface washing for this river otter plush toy.